The word catahoula originates from the Choctaw language and is translated to mean “sacred lake.” Catahoulas are the only breed of dog to have historically originated in the state of Louisiana.This breed has distinguishing features of speckled coats that can be a range of different colors, haunting “cracked” eyes, and a hard-working disposition. Catahoulas requires firm guidance and early socialization, as they can be independent, territorial, and protective. 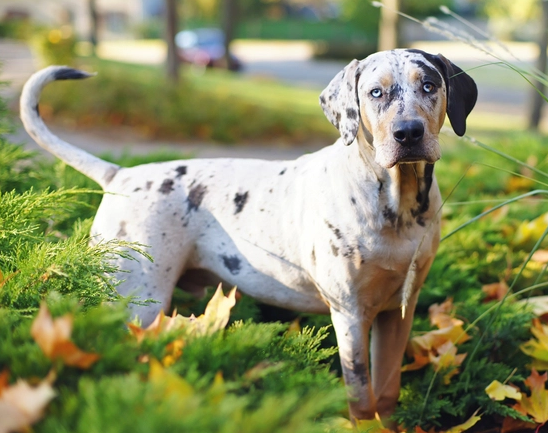 Catahoulas are not aggressive to their family and other people, but can see other animals as a threat. This breed was bred to drive out wild hogs and herd cows; because of this, he has a very strong work ethic and isn’t about to back down to anything. Providing proper socialization and able time for your dog to adapt to any new situation or person is the best way to ensure that no aggression will form. One of the most quality traits this breed has is the loyalty and protection it provides for the family. This is an excellent dog to have around children and is not only a companion, but a great working dog at heart.